Cat's Paw Nebula (which is also known as Bear Claw Nebula) is located in the constellation of Scorpius, so it can be best observed from sites having low latitude. At first glance it seems to be one of our galaxy's many star forming regions, like the Orion Nebula or the Eagle Nebula with the famous Pillars of Creation, and arouses interest only because of its appearance resembling a cat's paw, however the intensity of star formation in the nebula makes it one of the most productive star forming regions in the Milky Way. Cat's Paw Nebula was discovered in 1837 by the English astronomer John Herschel (son of William Herschel) during his South African expedition. It is identified by number 6334 in the NGC catalogue, and it is listed as four different objects in the lesser known Gum catalogue: Gum 61-64. The Gum catalogue containing 84 emission nebula of the southern skies was first published in 1955 by Australian astronomer Colin Stanley Gum. 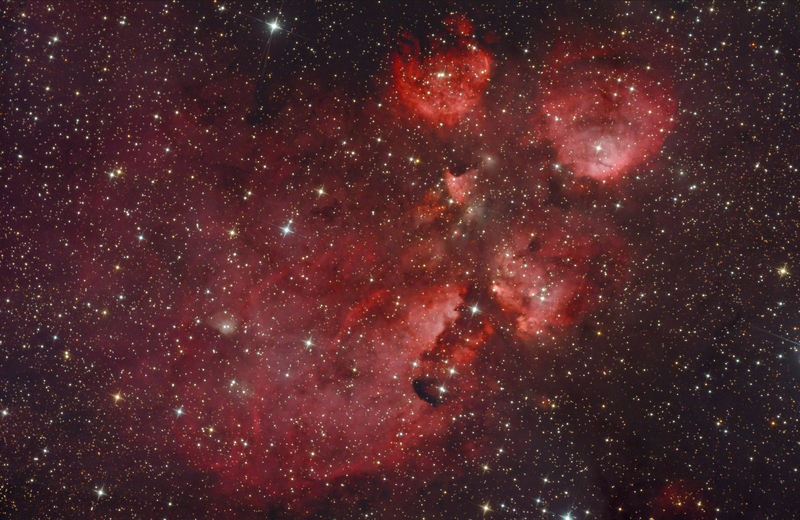 The distance of Cat's Paw Nebula is only 5500 light-years, which makes it one of the closest HII regions. The nebula is located near to the plane of Milky Way, where the interstellar medium is quite rich in dust, so the light emitted by the nebula has to travel through dust clouds before reaching us. Dust clouds absorb and scatter photons with shorter wavelengths (UV, violet, blue) more than photons with longer wavelengths, thus the intensity of shorter wavelengths is lower in the light of Cat's Paw Nebula we observe. That is the reason for the odd colour of the object. Emission nebulae are glowing because of the photons emitted by ionised hydrogen, which usually contains two wavelengths: the longer H-alpha (red) and the shorter H-beta (blue). In case of many emission nebulae the light does not have to travel through regions rich in dust, so the full spectrum of their light can reach us undistorted. Such objects looks pink-magenta. In the nebula having about 200000 solar masses of dust and gases a very intense star formation wave started a few million years ago. Usually a nearby supernova or colliding galaxies trigger such phenomenon, but in case of NGC 6334 these possibilities are dismissed by astronomers, however the real cause is still unknown. Ten thousands of newly born stars can be identified in the nebula, and more than 2000 of them are so young, they didn't have enough time to sweep away the remains of the dense cloud of gas and dust they were formed of. These stars are not even detectable in visible spectrum yet, only in infrared. Such intense star formation is commonly found in star burst galaxies, although it happens in vast regions of those galaxies, not in some small, isolated patches. Newly born stars in Cat's Paw Nebula are forming compact clusters, in which the average distance between stars is only one thousandth of the average star distance measured around the Sun. The young stars in the nebula are also quite huge, the largest ones can weight 30-40 solar masses. Astronomers pay considerable attention to this region in the sky because the event that triggered the star formation is still unknown, also because star formation in the galaxies of the early universe is very similar process, but observing those galaxies is quite difficult because of their distance, while NGC 6334 is located in our close vicinity, providing very good opportunity to study. Stars in the nebula can be observed separately, their physical characteristics and chemical composition can be measured. Thus Cat's Paw Nebula can help scientists to understand the way the galaxies worked in the early universe. The future of the nebula is also quite exciting, even it is not too long. The heaviest stars born in the nebula consume their supply of hydrogen within 5-10 million years, and at the end of their lives they destroy themselves by becoming supernovae. According to our current knowledge this will happen a few millions years from now, which is only a moment according to astronomical time-scale. The shock waves from the supernovae will ignite the next wave of star formation in the surrounding interstellar medium.